World Blood Donor Day is celebrated every year on the day of birthday anniversary of Karl Landsteiner on 14th of June in 1868. This event celebration was first started in the year 2004 aiming to raise the public awareness about the need for safe blood donation (including its products) voluntarily and unpaid by the healthy person. Blood donors are the key role player at this day as they donate life-saving gifts of blood to the needed person. World Health Organization is aimed to obtain the sufficient blood supplies from the voluntary and unpaid blood donors all over the world by 2020. According to the statistics, it has been noted that only 62 countries are getting sufficient blood supplies from the voluntary and unpaid blood donors whereas 40 countries are still dependent for the blood donations on the patient’s family member or paid donors. It is celebrated to motivate voluntary blood donors in rest of the countries worldwide. To make the blood donation act a precious gift to the receivers and get new life. WHO run this campaign by organizing many activities in all countries highlighting people’s stories who need immediate blood donation to continue their heart beat. 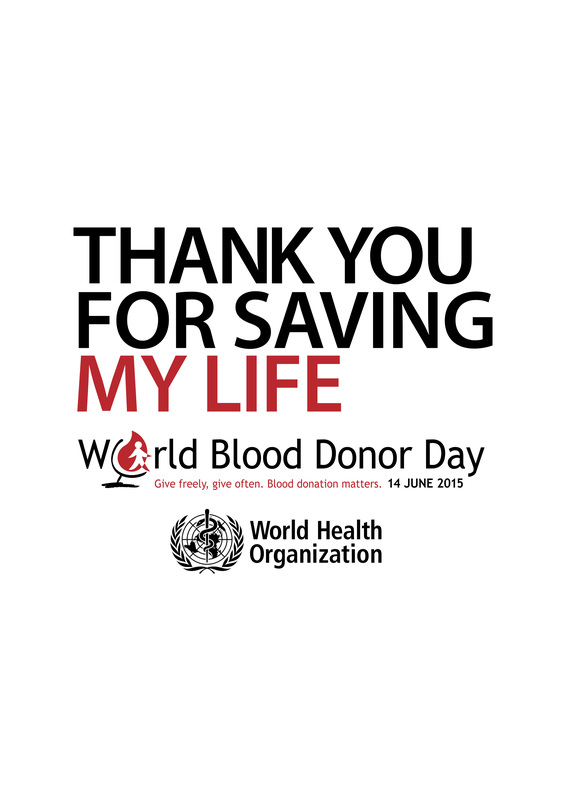 It is celebrated to say lots of thank to the voluntary and unpaid blood donors all around the world for saving millions of lives. It is celebrated to fulfill the 100% voluntary and unpaid blood donation need worldwide. It is celebrated to motivate blood donors for safe blood donation for saving the life of mothers and babies (country’s future). It is celebrated to reduce the death rates (mortality rate) because of insufficient blood supply. Approximately 800 women are dying off due to malnourish pregnancy, childbirth-related complications, severe bleeding during or after delivery and etc. To motivate voluntary blood donors through educational programmes and campaigns in order to strengthen the blood transfusion services. The theme of this year’s WHO campaign is “Thank you for saving my life”. It focuses on thanking blood donors who save lives every day through their blood donations and strongly encourages more people all over the world to donate blood voluntarily and regularly with the slogan “Give freely, give often. Blood donation matters.” The campaign aims to highlight stories from people whose lives have been saved through blood donation, as a way of motivating regular blood donors to continue giving blood and people in good health who have never given blood to begin doing so.